It’s the first day of the year that I’ve had to rid the car windscreen of ice. The temperature has plummeted in the last few days, and this morning, I dropped a big piece of beef brisket into a slow cooker to compensate. There are a couple of things to deal with yet, the last hangovers of the early autumn, a few things that cling to summer but don’t feel quite so out-of-place in the cold. One is this salad of roasted beetroot, goat’s cheese and pine nuts, a bowl full of big, robust flavours that neatly straddle the seasons. Beetroot are good at the moment, but they won’t be around for long. The big bunches on the market stalls are the last of the season, but they keep well in the fridge as long as you chop the leaves off and use them first. For this salad, the unpeeled-but-scrubbed beetroot is roasted, in a tray covered tightly with aluminum foil, a few sprigs of thyme, an orange, quartered but unpeeled, a few cloves of garlic, a good drizzle of olive oil and slightly too much salt and pepper for company. Use about half a kilo of beetroot, but more won’t hurt – beetroot roasted in foil with some punchy flavours is a good thing to have around in the fridge, and can make for a good mid-week lunch with some bread, so it’s worth making double here. Bake the beetroot in the oven at 190c for forty minutes to an hour, or until they’re cooked through. Check them by plunging a toothpick straight through the foil. The toothpick should go in nice and easily. All this salad needs is a simple vinaigrette – two tablespoons of cider vinegar, four tablespoons of vegetable oil and another two of olive oil, a teaspoon of honey and a few thyme leaves shaken together in a jar should do it. When the beetroot is done, take it out of the foil parcel and cut into big chunks. Let the beetroot cool, then toss it with half of the dressing and sprinkle over the zest of a lemon. Cover with clingfilm and refrigerate overnight. 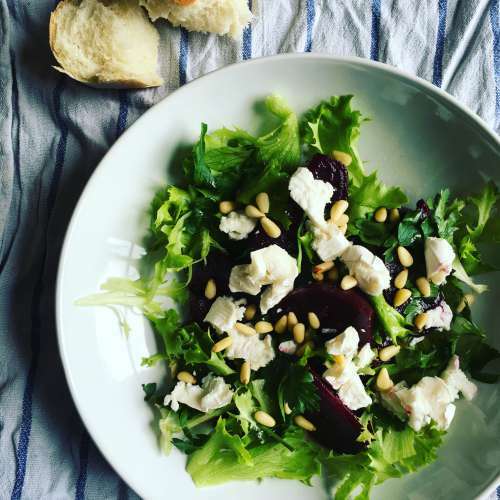 The next day, put the salad together – a handful of rocket leaves, or some other slightly bitter salad leaves, some beetroot, some torn up pieces of a good goat’s cheese and a few pine nuts, toasted if you want, finished with some more of the dressing. Very simple, very easy, very tasty. This is from A Year in Cheese: A Seasonal Cheese Cookbook, by Alex and Léo Guarner.